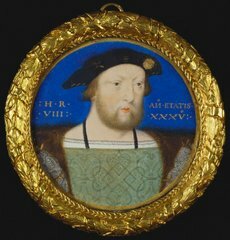 The earliest portrait miniatures known to have been produced in England are head-and-shoulder portraits of the young Henry VIII attributed to Lucas Horenbout. 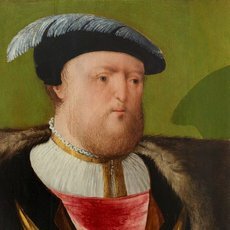 Could there be links to the 16th-century portrait panel of Henry in the Art Gallery of NSW collection? 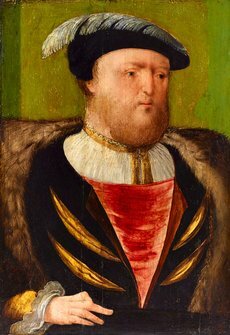 Having established the Gallery's Henry VIII portrait was some 500 years old, there were new questions to answer. 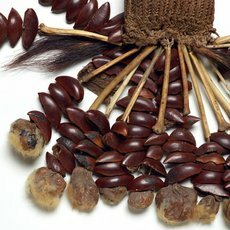 What were picture frames like in Tudor England, and how do you go about making a reproduction frame fit for a king? 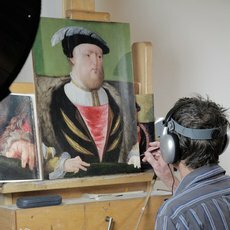 Even before our recent investigations into the mysteries of the Henry VIII portrait in the Gallery’s collection, we knew that some alterations had been made to the artwork. Now, the painting has been restored to let the original work shine. It’s truly extraordinary how much information there is locked within a piece of wood. To help unlock the secrets of the Gallery’s Henry VIII portrait, which is painted on an oak panel, we turned to dendrochronology or tree-ring dating. 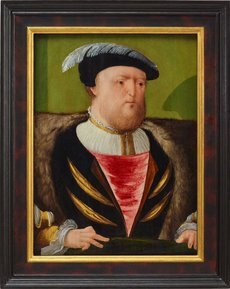 Mystery surrounds the Gallery’s portrait of Henry VIII. 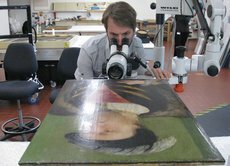 To get closer to the truth – and to help us plan its much-needed conservation treatment – we needed to get much, much closer to the painting itself. The Art Gallery of NSW owns a portrait of Henry VIII, one of the world’s most recognisable figures, but until recently we knew little about it. Some of the artwork’s deepest secrets have now been revealed, following a major research project. 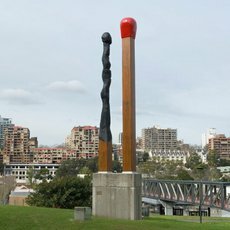 Looming eight metres high, Brett Whiteley's giant pair of matches has become a Sydney landmark, marking the approach to the Art Gallery of NSW from Woolloomooloo. The sculpture has just undergone extensive conservation treatment. 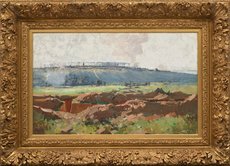 Almost 100 years after Arthur Streeton painted the WWI battleground of Villers-Bretonneux, a major conservation project has restored both the painting and its frame. 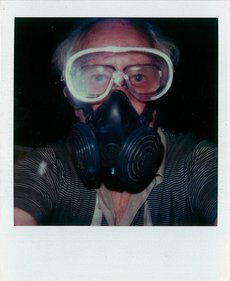 Sidney Nolan is one of Australia's most celebrated artists. His last studio, in the Welsh Marches on the border of Wales and England, is preserved for researchers and visitors, and still runs as an organic farm. 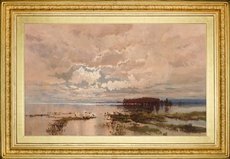 Frames have seldom been paid much attention in art history but they are art’s great scene-setters. 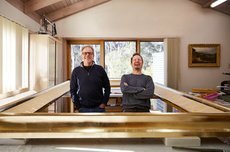 A visit to the studio of the Gallery's frame-maker illuminates an art form that lives in the margins. 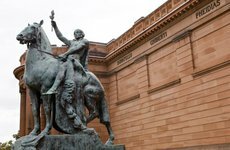 You may have noticed scaffolding being erected out the front of the Gallery as two familiar figures on horseback get some much-needed conservation treatment. A recent conservation project has brought an important Australian painting - Hugh Ramsay’s 'The foil' 1901 - back to life. 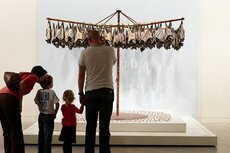 An installation of fruit bats on a Hills Hoist by artist Lin Onus has charmed many visitors since its creation in 1991. However, the cracks that appeared in some of the animals started us on the trail of solving a conservation mystery. 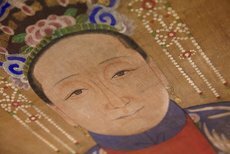 An exquisite pair of 18th-century Chinese portraits is on display after some seriously challenging conservation treatment that tested the mettle of the Gallery's head of Asian art conservation. 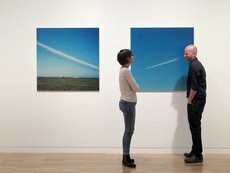 Anyone notice a nine-metre long, boldly striped painting miraculously appear in the Gallery last week? 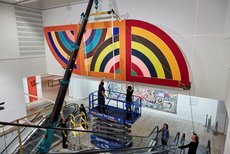 The work by Frank Stella is a collection favourite – so where has it been? These days it's easy to take the fragility of the printed photograph for granted. 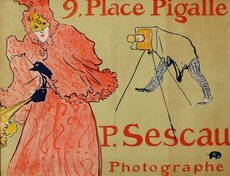 Changes to the way we create images, and how we print them, are presenting a challenge to conservators. 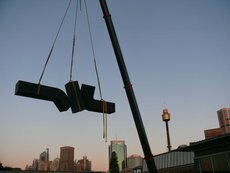 After a mammoth conservation treatment, a massive one-tonne sculpture by one of Australia’s most important and highest profile sculptors is back on display at the Gallery - structurally stable, rust removed and with a satin black finish. 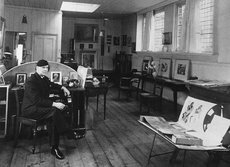 One of Australia’s best known and most influential landscape painters, Arthur Streeton was an official war artist during World War I. An important work from his service recording the battlefields of Europe is in urgent need of conservation treatment. 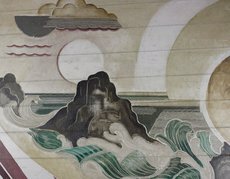 The Gallery has just one painting from Captain James Cook's voyages in our collection but its poor condition has meant that for some years we haven't been able to exhibit it. As works of art, Clement Meadmore's massive outdoor sculptures appear to effortlessly defy both gravity and the weight of their steel forms. As a practical challenge, getting one of the roof is far from effortless. 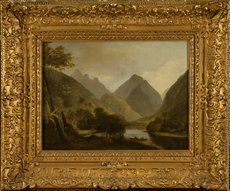 WC Piguenit's 'The upper Nepean' is back on display following conservation treatment that has returned its gorgeous golden frame to its former glory. A little over a year ago I began my three-year traineeship in reproduction decorative frame-making with David Butler, who has been making frames for the Gallery for over 20 years. 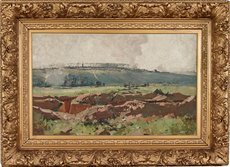 Several Roy de Maistre artworks were in poor shape due to inappropriate storage and remedial treatment before the Gallery acquired them. A recent conservation project has remedied much of the damage, allowing them to be displayed again. It's one of Tom Roberts' most important studio paintings of the 1880s but it's rarely been seen due to its poor condition. 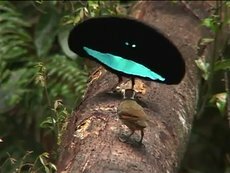 A new conservation project is underway to change that. It’s one of the Gallery’s most-loved works of art and now it’s back on display in its magnificent gold-leaf gilded frame after a major conservation project that was also an Australian first.